We left Santiago Chile to fly to Lima, Peru. Good thing we arrived at the airport early because there was some problem with our tickets (again my rudimentary Spanish wasn’t as helpful as I would have liked) and we waited for check in and our boarding passes for over an hour. We made our flight without much time to spare once we cleared Chilean customs—so no snacks or water. Luckily LAN is a great airlines and gave us plenty of snacks and drinks as we traveled to Peru. 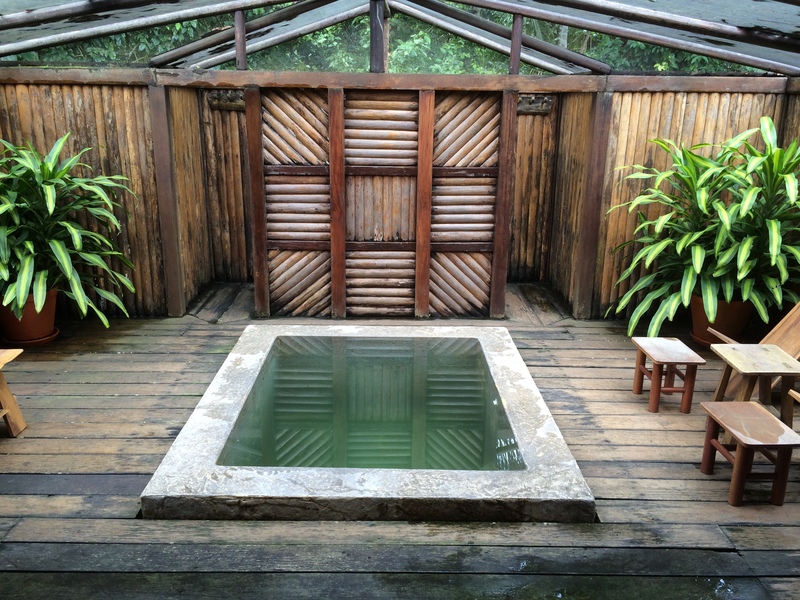 We spent the night at Casa Andina in Miraflores. It is a nice area, safe to walk around even at night, and we walked to Kennedy Square (yes after “our” JFK) and then to a shopping/dining area overlooking the ocean called Larco Mar. It was very modern and included many of our USA favorites like Banana Republic (shout out to Heather and Steven—our great friends who met at BR!). Probably not the most authentic of experiences but it was definitely comfortable and the girls got to order pasta which always makes them smile and actually eat. 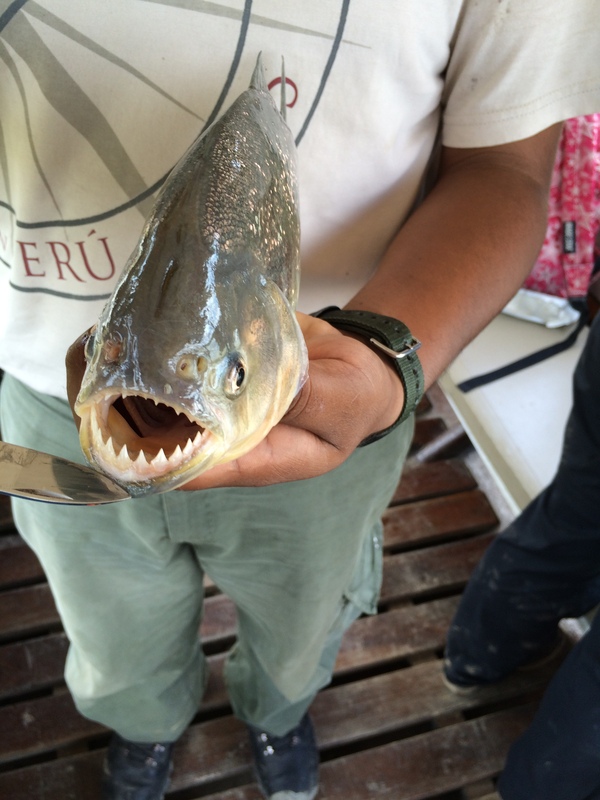 The Casa Andina staff was very friendly and provided great service. We got up early the next morning and flew to Puerto Maldonado via Cuzco. 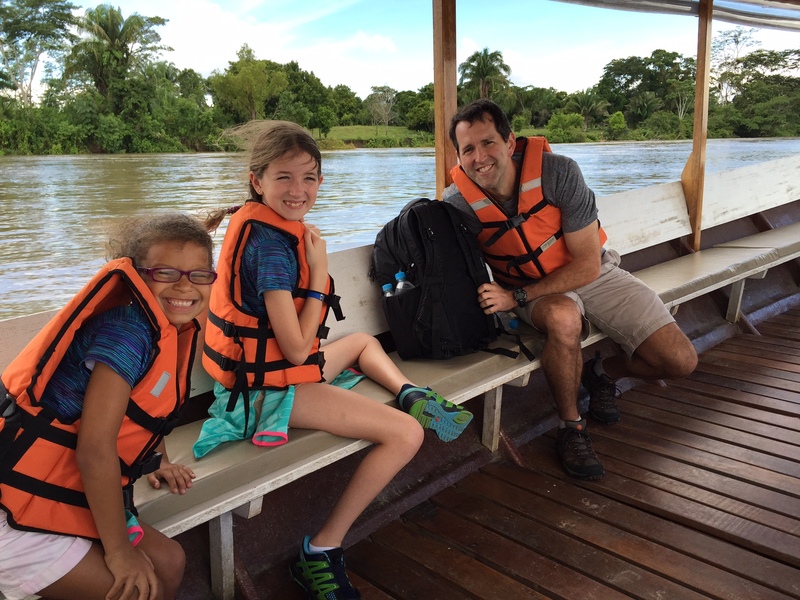 We were in 11,000 feet altitude for about 30 minutes and then headed back down to closer to sea level in the Amazon Basin. The flight to Cuzco was fine—but the pressurization had some issues from Cuzco to Puerto Maldonado and I thought my ear drums were going to burst—most of the young children on the plane were crying—it was definitely the most painful ear experience I have ever had flying. Can anyone tell me why people put cotton in their ears when flying—does that actually help? Landing was an experience like what you’d see on a National Geographic special. 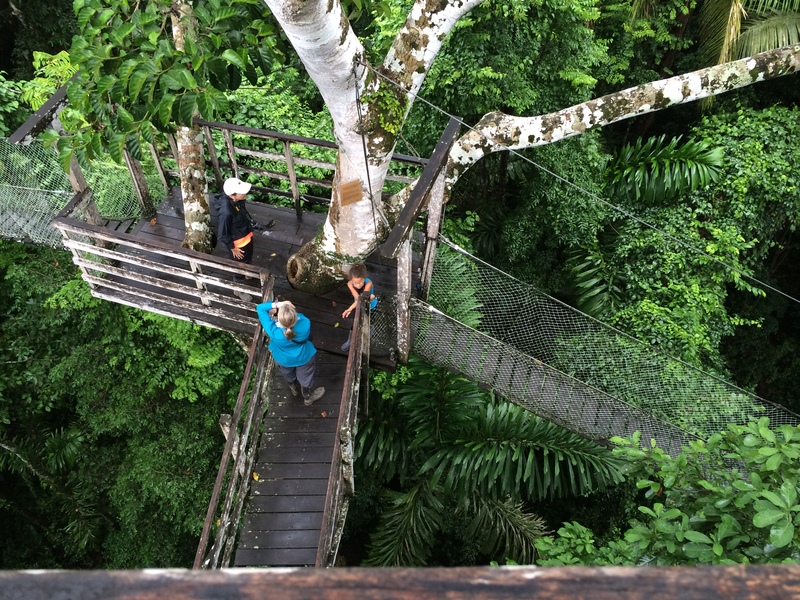 You fly over a partly cloudy jungle and land on a short landing strip surrounded by thick foliage. There is hardly a tower to speak of, not a single other plane and we half expected to see jungle creatures wandering around on the edge of the runway. This was definitely the smallest airport we’d been too, even smaller than the Eastern Iowa airport outside of Cedar Rapids, Iowa. Once we took our luggage off of one of two luggage conveyors (you can actually see the luggage pull up to one side of the conveyor while you’re on the other side, its all open-air). When leaving the “terminal”, we were escorted by our tour guide, as were most people, but if you didn’t have a guide, you were swarmed by taxi drivers wanting to take you into town. And when we say taxi drivers, we mean motorcycles converted to have 3 wheels and a rickshaw-like seat–definitely for those who travel light. We boarded a small tour bus, with a real engine and seats, and were off to the boat landing. 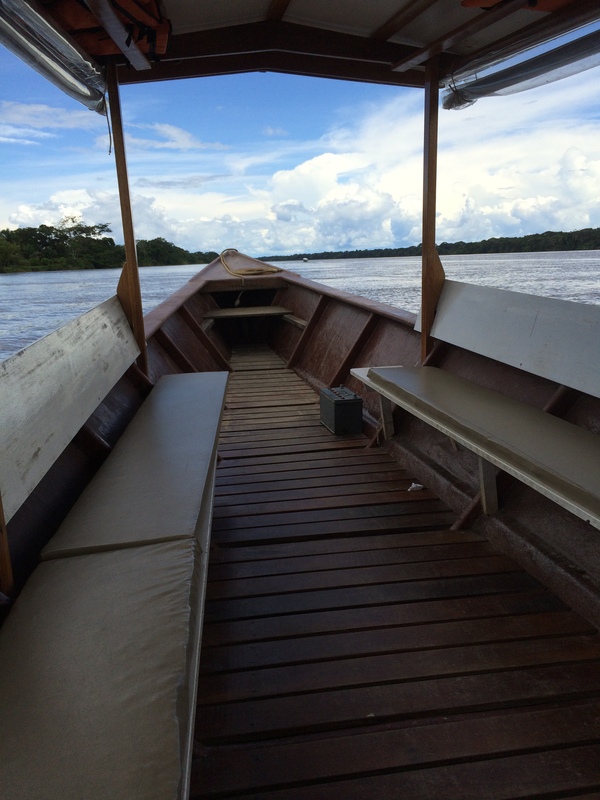 We boarded a boat that took us on an hour ride down the Rio Madre de Dios to the Inkaterra Reserva Amazonica. Due to rainy season, the river was running very high and fast. It reminded us a lot of the Mississippi River after a lot of rain and it’s nearing flood stage. 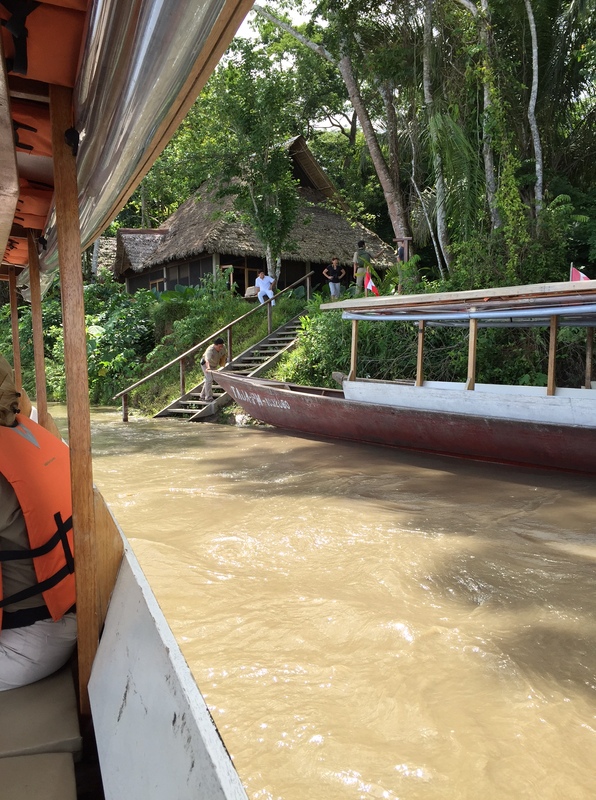 The river was a muddy brown color and carried a lot of debris—trees, limbs, etc… The boat drivers at Inkaterra were very talented and creative—there was no obstacle they couldn’t get through—including entire trees blocking our way–they just went over them! The boats we traveled in looked like oversized canoes–about 25 feet long, fiberglass-hulled, with benches on both the port and starboard sides, so you sat facing your fellow passengers. The boat came to a sharp point in the front and has an outboard motor hooked onto the squared off back. The floor is made of 3in wood planks with about a 3/4in gap between the pIanks. 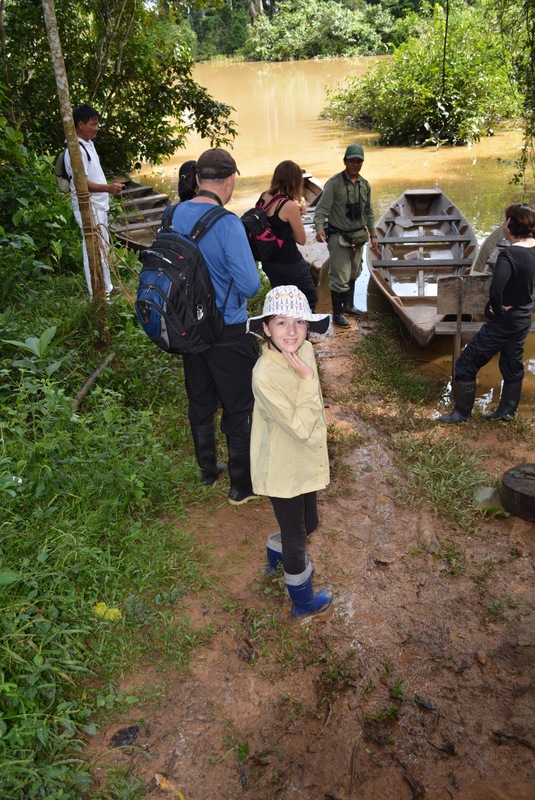 (We later found that some of the gaps were big enough for a piranha to slip through if you dropped them while taking them off your hook) The boats were not your typical touristy stable boat, if you moved, the whole boat moved. If you are a big person (like Jared at 165lbs) shifting from one side of the boat to the other would create sudden gasps out of most passengers and a scolding look from our boat captain. Although good sized, the “canoes” were able to maneuver around and over all of the debris. I think the engine props were made out of chain saw blades. Once we arrived at the resort, we were brought to the main house where all meals were served—beautiful dark woods filled the interior with high ceilings and an upper balcony which was full of cozy nooks to hang out. 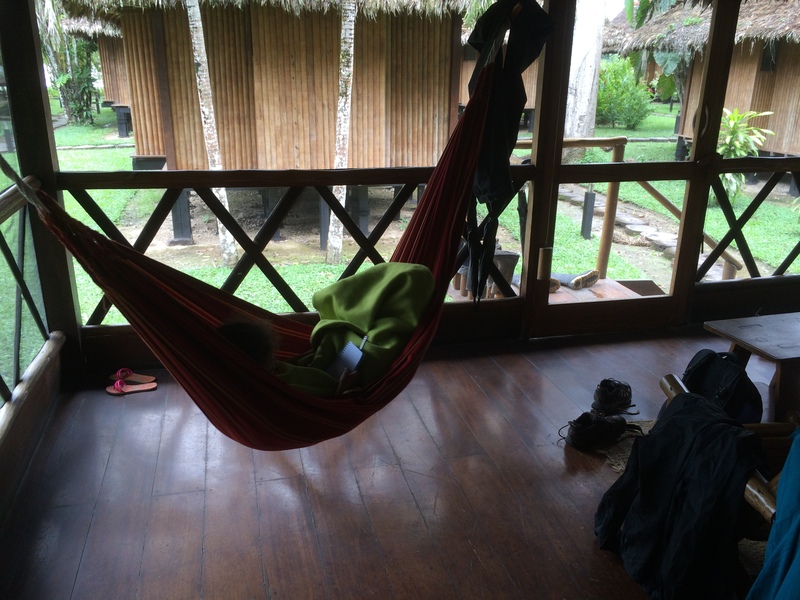 Our sleeping hut—a short walk away from the main house–had a thatched roof, screened in windows, and a raised wood floor, a plunge pool, and two showers “indoor” and “outdoor”—it is the way to camp!. 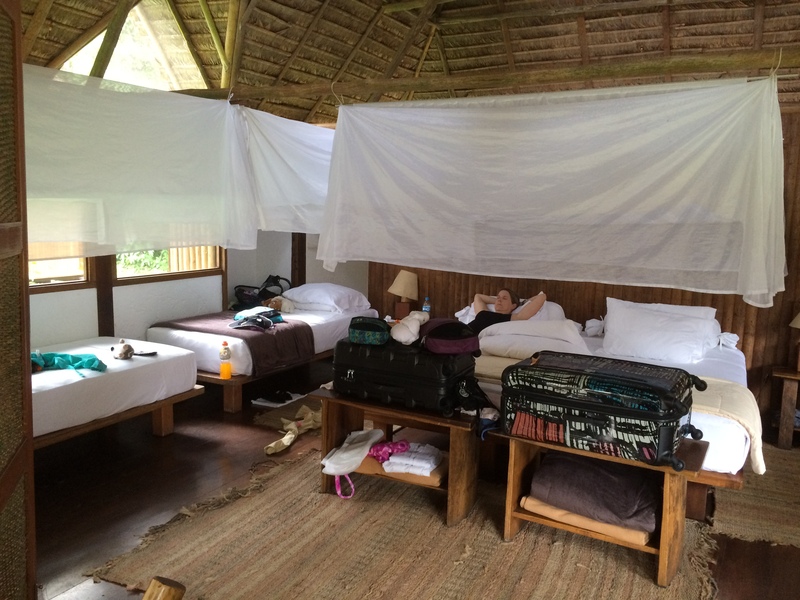 We had mosquito netting over our beds which we tucked in at night. It was one of the coolest places we have ever stayed! They shut the power out during the day and at night for a few hours to conserve energy which made it seem all the more primitive. The sounds the first night kept me awake and had me checking on the girls to make sure they were ok (they were all of 6 feet away from us). “Is that sound normal and ok?” was taken to a new level. The second night, we took a Night Walk into the jungle (are ya crazy?). Not like walking through the jungle isn’t freaky enough, going at night with shadows and strange movement and noises added a whole new dimension. 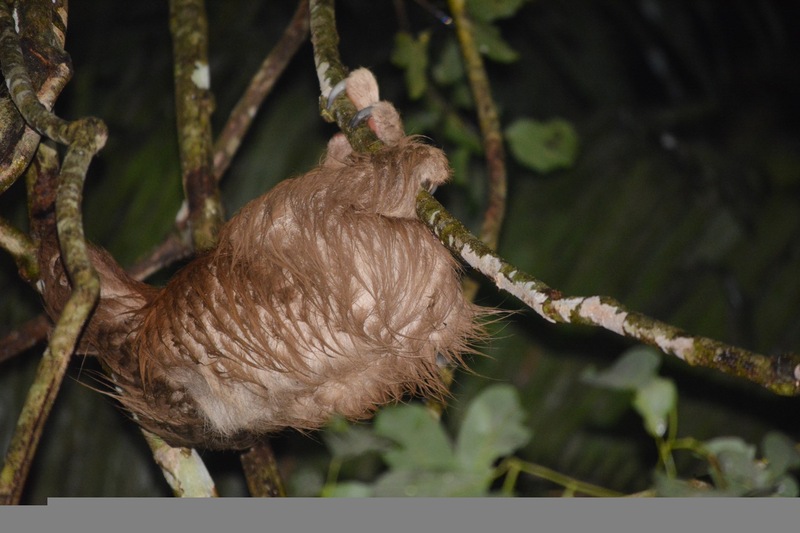 The Night Walk started off tame with frogs on leaves outside the eco center and soon got more interesting with a 2-toed sloth hanging from a branch above. 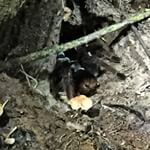 The scariest thing we saw was a tarantula hunting for bugs….. and anything else that moved. This is not the tarantula you see on Jimmy Fallon—simply touching these spiders would send your hand into an instant swell and likely worse because of the tiny hairs that shoot off of their legs for protection. Once the tour was over and we came out of the trees, we were treated to one of the clearest and most brilliant night skies we had ever seen—the stars were AMAZING! Typically this time of year it is cloudy and raining in the rainforest, so it was rare to get such a clear night to see all of the constellations. Our final day there, Jesus, put together a scavenger hunt for Lilli and Isabella and they had a great time (while Mama and Daddy packed up suitcases). Jesus used to be a school teacher so he was the perfect guide for us –he had a LOT of patience and really focused on making sure the kids had a good time. Isabella amused him with her ongoing commentary on just about everything. 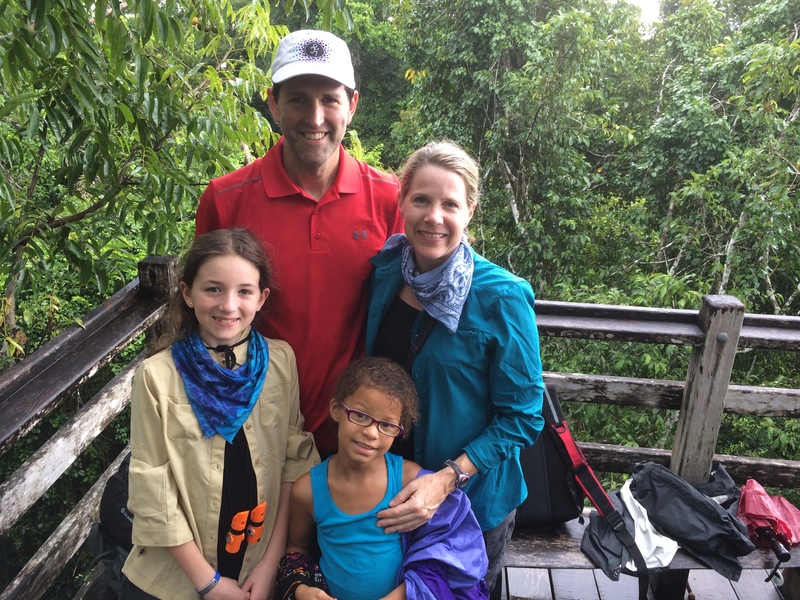 🙂 During the scavenger hunt, the girls made pink lemonade with red dye from plants in the rainforest, made bracelets, did some arts and crafts, and went on a little hike around the resort and ate termites–Yes—they actually ate termites when we can’t even get them to eat their vegetables and chicken! I don’t think we will see any major shifts in diet as the girls thought the termites tasted like wood and don’t care to eat them again. We were busy all three days and I’m not sure who was more tired, the girls or us. Many nights we barely lasted long enough for dessert to be served. We waved goodbye to the rainforest and headed back to the Sacred Valley of the Incas. Check out the next entry for details on all of the fun we had there—including doing one of the Top 10 most dangerous hikes in the world. Good to hear from you! Your sleeping hut sounds cool:) Termites? You’ve lost your mind. Be safe and stop eating bugs.